The teeth that our cats and dogs have are very different looking than our teeth, but we do have something in common with their teeth.....plaque. Plaque is a soft, sticky, white material that adheres to the surface of the teeth right below the gum line and underneath the gum tissue. It is comprised of bacteria, saliva, cells from the lining of the mouth, and material from the food they eat. As it forms, plaque causes inflammation of the gum tissue which is referred to as gingivitis and is recognized by redness and swelling of the gums. When the plaque remains on the teeth for more than 2-3 days, it starts to mineralize and becomes tartar. Tartar is hard like rock and has a light tan to dark brown color. This material is more than a cosmetic concern, for as it forms it finds its way under the gum line and starts to damage the attachments which hold the tooth root in the socket. These attachments are called periodontal ligaments and are found in the periodontal space. 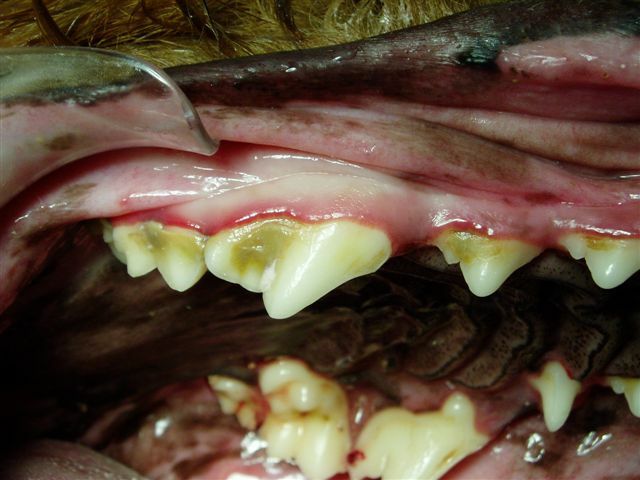 Tartar and infection can lead to permanent periodontal damage and is referred to as periodontitis. If this disease is left untreated, the tooth will become loose and infected, necessitating removal. As we learn more about dental disease, we realize that routine professional dental cleaning can greatly reduce the damage and consequences which result from excess tartar. We now know that dental infections can affect other areas of the body. Heart valve damage, kidney disease, chronic liver inflammation or infection, brain and spinal cord disease have all been associated with patients who have chronic bacterial dental disease. Chronic dental infection and inflammation can also lead to chronic tonsillitis and oral cancer. So, keeping the teeth clean is not just for sweet breath and a pretty smile. There are several home care products that can remove or prevent plaque accumulation before it becomes tartar. I’ve listed them in the order of most effective to least effective. The first two options help all the teeth whereas the other methods only help the chewing teeth in the back of the mouth. Daily brushing is the best way to keep the mouth healthy and reduce the need for a professional dental cleaning. Brushing is the only technique that is able to clean the outer surface of all the teeth. Pet toothpaste is used to prevent swallowing fluoride, which is in human toothpaste. Giving your dog a treat after each brushing can help train him/her to hold still and anticipate the treat which will follow. Dental diets (T/D by Hill’s and DH by Purina) can be mixed with your dog’s dry diet, allowing them to regularly clean off the teeth as they eat. These diets have a cross-fiber design which prevents the nugget from cracking apart and allows the food to mechanically scrape the tooth all the way up to the gum line. Unlike brushing, this method only works with the chewing teeth. 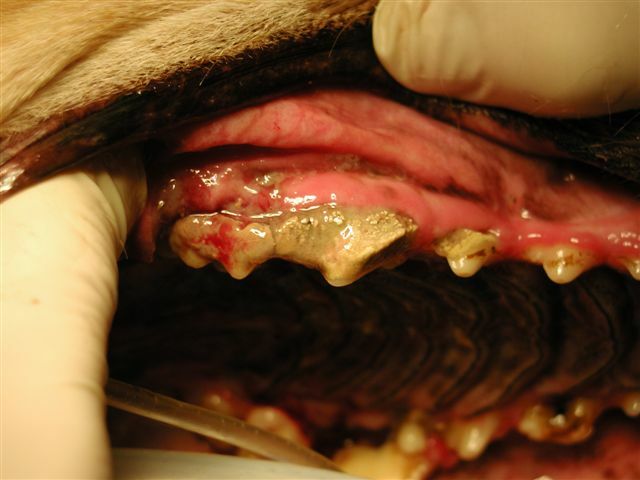 Dental chews like Greenies, which allow the teeth to penetrate deeply, have been shown to reduce plaque if used daily. Chewable treats, like milk bones and rawhide, have minimal cleaning advantage over dry dog food, since the teeth do not penetrate deeply into the chew. 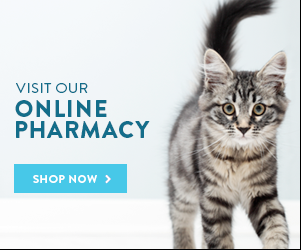 Let’s take care of our pet’s teeth so they can live a long, happy and healthy life.